* 26 June 2009: Tungsten mining threatens RAMSAR site, South Africa's Verlorenvlei. Read the Media Release. * 22 June 2009: Claire Spottiswoode, one of the Cape Birding Route founders, was part of the exploratory team at Mount Mabu. The mountain is part of the newly discovered largest rainforest in Southern Africa. * 11 June 2009: A colour-ringed Black Sparrowhawk visits the Birding Africa office garden. Read why it's a 10 months old male! Welcome to the Cape Birding Route! 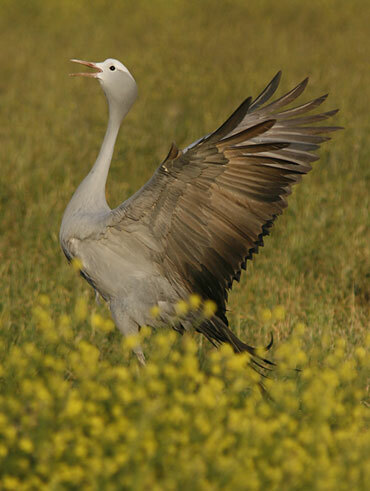 Choose western South Africa: over 610 bird species recorded, including 220 species in a single day. A biodiversity hotspot at the south-westernmost tip of Africa, it offers over 70% of Southern Africa's endemic birds and world-famous pelagic birding. This region is best explored from Cape Town. The Cape Birding Route website presents almost the entire printed book "Essential Birding: western South Africa - Key Routes from Cape Town to the Kalahari" (by Callan Cohen and Claire Spottiswoode and published by Struik in 2000). This book has been completely updated in 2006 within the framework of the "Southern African Birdfinder: where to find 1400 bird species in Southern Afria and Madagascar". * 9 birding routes in western South Africa. * a full section on pelagic birding and bookings. * birder's accommodation along the routes. The Cape Birding Route assists birders who have only a few days in Cape Town, those who are looking for a diversity of African birds or those in search of exactly where to find that Cinnamon-breasted Warbler in the Karoo! Explore the route on this website! Explore bird-finding information in the different routes: use clickable maps or options in the side bar menu. We're continually upgrading the site and the "West Coast" chapter is currently the most complete. Explore the regions (below), see what's new, read more about us and the project. Introduce yourself to birding in the Cape, browse the selected accommodation, book a pelagic trip, view recent sightings or investigate bird guides for part of your trip. Comments welcome! We are hoping to make regular improvements to this service. Please contact us with your comments and suggestions. To be kept informed of Cape Birding Route updates, please contact us to receive our newsletter. Reviews on our book "Essential Birding"
"...this really is an essential guide for any birder visiting the Cape... a real delight to read... not only clear and easy to follow, but spot-on for locating the specialties... I recommend that you [obtain] a copy, you may well be tempted to make plans to visit this outstanding region"
Ron Johns, BIRDING WORLD, on Essential Birding: western South Africa. Reviews on our book "Southern African Birdfinder: where to find 1400 bird species in Southern Afria and Madagascar"
"Southern African Birdfinder. We believe that this is the most useful book you will buy this year." "Perhaps a better title for this book would be “How to see 1400 bird species in Southern Africa in the least possible time!”. The first thing you think when picking up this book is “How on earth did they gather all this material?”. This really is a tour de force and packs an enormous amount of information into a very compact book and any previous site guide for the region is now truly redundant. Covering 335 birding sites in South Africa (193), Namibia (27), Botswana (14), Zimbabwe (27), Mozambique (21), Malawi (16), Zambia (18), Angola (5) and Madagascar (13). A helpful aspect is that these sites are divided up into 38 birding routes that allow the reader to plan trips that may last several days or a week. Each site is described and in many cases a map is included. Key target species for each are highlighted in red and are supported by a cast of commoner species. Many of these are illustrated. For a number of sites the description is very detailed with step-by-step guidance around the area. Some 150 species are selected for special treatment in a separate chapter where tips are given on where and when to find them. A full checklist list of the 1400 species covered indicates each bird’s status and a list of sites where they may be found, cross-referenced back to the main text. Other introductory chapters include useful information about the region including a section on pelagic birding with a helpful month-by-month species list. This is a great book that really does justice to a fantastic part of Africa and its birds. "